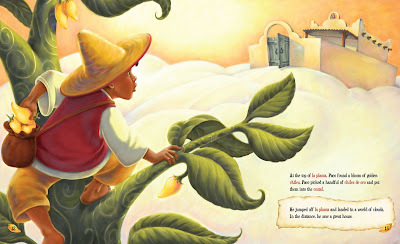 Set in the American Southwest, Paco and the Giant Chile Plant/Paco y la planta de chile gigante is an adaptation of Jack and the Beanstalk. Told in English with Spanish embedded in red throughout, Paco sells his family's vaca (cow), their only source of income, for a handful of semillas de chile (chili seeds). When he plants the seeds, a giant chile plant grows way up into the sky. Of course, a curious Paco must climb up the plant, and when he does, he meets the terrible giant we expect him to meet. However, the surprise ending of the story is anything but expected and provides an interesting twist. Elizabeth O. Dulemba's rich gold-toned illustrations reflect the colors of the desert and give us a glimpse of the clothing, dwellings, and culture of the American southwest. *Image courtesy of Raven Tree Press. This is an ideal book for bilingual children or English and Spanish learners. A glossary in the back of the book offers definitions of all of the Spanish words in rojo. It would also make a great read aloud, especially for children who like a little action and suspense in their stories. Read interviews with Elizabeth Dulemba at Stone Soup and Art & Soul. And visit her website for some fun book-related activities. If you've reviewed Paco and the Giant Chile Plant, leave a comment with your link, and I'll add it here! Since I've been reading to my nearly 15-month old daughter pretty much every day since she was born, I've seen her interest in books and reading grow. She enjoys looking at and touching the pictures, listening to me read in different voices, and flipping pages. Over the past month, I've noticed that our reading time has been gradually getting longer and longer. When she started walking, I was lucky to have to her sit still for five minutes, but recently, she's been sitting on my lap for about 15 minutes at a time, getting us through two to three books. And last night for the first time, she initiated reading time. She walked over to the bookshelf and started pulling books off and putting them in floor (not an unusual occurrence as I'm constantly putting books back on the shelf.) However, this time she sat down in the floor and started going through all of the books. Then she picked two up, brought them over to me, and sat on my lap. She WANTED me to read to her, and she CHOSE the books she wanted read! What were these books? Princess Baby by Karen Katz, and Everyone Poops by Taro Gomi. We read Princess Baby twice and Everyone Poops once. Then she climbed off my lap with Everyone Poops still in her hands, sat down in the floor, and started "reading" out loud to herself. Her favorite page in that particular book seems to be a two-page spread of a whale, which incidentally does not have a picture of whale poop. So, while her favorite book seems to be a book about poop, last night I felt a little lump in my throat as I watched my daughter choose her own books and "read" for the first time. When my daughter was born almost 15 months ago, the first couple of weeks at home were full of visitors. I was never lonely, and in fact, I yearned for one day when I could just be alone with my new baby. That day finally came when she was about two weeks old. My mother who came to help out had gone home, and my husband had gone back to work. I remember looking at the baby thinking: "Now what?" "What are we going to do today?" "Will I be able to do it all by myself?" Too bad I didn't have a copy of the Rookie Mom's Handbook with me. 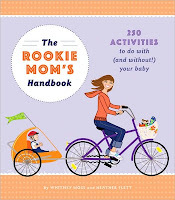 Co-authored by two mothers, Heather Gibbs Flett and Whitney Moss, and based on their popular website, The Rookie Mom's Handbook contains 250 activities you can do with (and without) your child in the first year of his/her life. Organized into sections based on the baby's age, there are a variety of activities sure to appeal to every mother. Most of the activities don't cost a thing or are inexpensive, and many are designed to help mothers bond with their new babies and also preserve their sanity. "This outing is perfect for beginners. Gather your baby and go to your favorite outdoor breakfast venue. Pack a journal, a trashy magazine, or a pile of thank you notes and head to a cafe. Park the stroller right next to you and breathe in the fresh air. Before you leave, buy some baked treats for dessert tonight. C'est magnifique!" (p. 24). I'm also strong believer in mothers taking time out to do things just for themselves, so I appreciate the fact that the book offers a number of "mom-only" activities. #126: Party like you have a 6-month old. The tone of the book is very casual, yet supportive. As I was reading, I felt like my girlfriends were talking to me. Never once does it downplay the difficulty and stress related with being a new mom. Instead, it welcomes new mothers into motherhood by offering down-to-earth, friendly advice. This would make a great gift for a new or expectant mother. Check out the Rookie Mom's blog and other reviews in Cool Mom Picks and iVillage. That live in this beautiful sea..."
Well, to put it simply, Giselle Potter's new picture book version of this poem is absolutely stunning. The rhythmic verse of the poem that always stays in my head long after I read it is accompanied by Potter's dreamy and enchanting illustrations in rich, deep tones of blue and green. Potter has masterfully captured the magical and ethereal feel of the poem, and children will love hearing this read to them over and over again. Perfect for a bedtime read-aloud, I highly recommend this book. 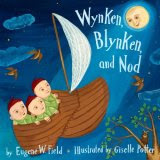 If you've reviewed Wynken, Blynken, and Nod, leave a comment with your link, and I'll post it here. I received the four of Usborne's Look and Say books at my baby shower when I was pregnant with my daughter, and now that she's trying to say words, I pulled them off the shelf a couple of evenings ago. She really enjoys looking at the pictures and trying to repeat the words I say as I point to the pictures in the book. So far, my daughter seems to enjoy the School book the best, which is surprising since the only animal in the book is a tiny hamster in a box a boy is holding. Each book is divided into five tabbed sections. The tabs themselves are rounded cardboard and contain a small picture that clues readers into the subject of the section. For example, in School , there is a tab with a picture of a colorful ball. It opens up into a two-page spread. On the left side are pictures of common things you commonly see on a playground with the word underneath the picture. On the right side is a group of children and a teacher playing on a playground, using the items that are pictured on the left. The final spread in the book shows all of the words that were introduced, along with their pictures. Here's a sample spread from Birthday to give you a better idea of what I'm talking about. The illustrations themselves seem to be a mixture of clay models, photographs, and watercolors, though most, including the people in the book, are impressive clay models. There are a variety of other objects on the right-hand sides, so you're not limited to teaching children only the words that are featured on the left. A variety of ethnicities and genders are also represented in the books. If you're looking for books that will help introduce your toddler or preschooler to new words, these would make an excellent choice. For babies just learning to repeat sounds, point to pictures in the book, say the word underneath, and ask your baby to repeat it. "That's a car. Can you say car?" Praise the child when they attempt to repeat a word or imitate a sound. Be careful not to get frustrated if they can't do it. Just move onto the next word. They're learning even if they aren't able to repeat it just yet. For older preschoolers who are able to identify objects, say the word and ask the child to find the object. You can also ask other questions to help them build and practice vocabulary. "Where's the bicycle? What color is it? Is a boy or girl riding it?, etc." 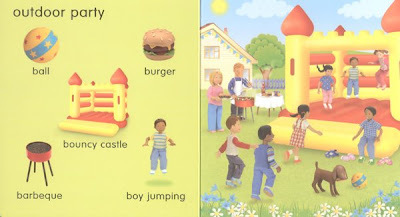 Again for older preschoolers, have them find the objects listed on the left hand side that are also located in the scenes on the right hand side. "Where is the apple? Who's holding the apple? What color is his shirt? , etc." In this biographical picture book, we learn the stories of two people from very different backgrounds, but who both struggled for equality. One is an American boy named Martin, the son of a minister who is angry when he sees “Whites Only” signs everywhere in his community. The other is a Polish boy named Abraham Joshua Heschel, the son of a rabbi who follows in his father’s footsteps. When he’s a young man, he’s kicked out of his German university because he’s Jewish and is angry when he sees “No Jews Allowed” signs everywhere. Abraham goes to America in hopes for a better life, but when he arrives, the country is in the throes of the Civil Rights Movement. He hears of Dr. Martin Luther King, Jr., the boy we met in the beginning, who is now a man, and joins him in the Selma Freedom March. Raul Colón's rich pencil and water color illustrations complement the books serious and deferential tone. He explains his palette choices in the jacket flap. The illustration of Abraham's boat arriving in the choppy waters of Ellis Island with the Statue of Liberty standing tall is particularly stunning, and the final illustration of King and Heschel provides a sense of hope. This is the inspirational story of two powerful men who joined forces to bring change to the world. A must-read for every child, and a must-have for every classroom. Do you have a review of As Good As Anybody? Leave a comment with your link, and I'll post it here. Visit Picture Book of the Day for more Nonfiction Book Reviews! Let's face it, being a kid is difficult--dealing with peer pressure, the desire to fit in, the search for self-identity, etc. Sometimes kids participate in things like bullying and teasing they're really not comfortable doing, but they just don't know how to stand up to other children. Unfortunately, way too many children are on the receiving end of this teasing and bullying which can permanently damage their self esteem and sadly sometimes result in suicide or violence towards others. Luckily, Sandra McLeod Humphrey's has created a new book to help children learn how to stand up for other children and even for themselves in an effort to staunch the harmful bullying that is seen in schools. Ms. McLeod Humphrey decided to write Hot Issues, Cool Choices: Facing Bullies, Peer Pressure, Popularity, and Put-downs when she heard the story of Tommy, a 12-year old boy, who committed suicide because he was bullied. The book is dedicated to Tommy's memory. Through numerous interviews with teachers, students, and parents, Ms. McLeod Humphrey created a fictional elementary school, Emerson Elementary, and presents over 25 scenarios told from the point of view of children in the school. The scenarios cover a wide range of issues, from name-calling, harassment, peer pressure, rumors, and even suicidal thoughts. At the end of each scenario is a number of thought-provoking discussion questions asking students to talk about what they would do, how the children in story felt, and more. "What do you think Eric should do? Why?" "How you feel about Jeremy?" "Do you think Eric will really lose all his friends if he invites Jeremy to his party?" "Do you think Jeremy knows how Eric and his friends feel about him?" It's these "Trading Places," questions that I feel are the most powerful. Putting yourself in someone else's shoes really helps others feel empathy and perhaps enables them to be brave enough to stand up and change destructive behaviors. The overarching message of the book is to follow "the golden rule" and to treat others the way you'd like to be treated. In the author's final note, Ms. McLeod Humphrey states, "You don't have to be 'best friends' with everyone, but you can still treat everyone with respect and courtesy" (p. 121). In the fact of the book, you can also find bullying statistics, online resources, and an afterword that includes more information about bullying and action steps bystanders can take to help prevent it. This book makes a perfect read aloud for teachers and students and parents and children, and is chock full of discussion opportunities that can make a huge difference and perhaps even save lives. It's been nearly seven months since I started The Well-Read Child, and it's turned into something bigger than I ever imagined it would. I've "met" many parents, teachers, librarians, and bloggers who share my passion about reading and literacy. I've received the opportunity to review numerous books and interview some wonderful authors. I'd like to extend a heartfelt thank you to all of you who read The Well-Read Child. I never even thought anyone would care enough to comment, so each time I receive a comment and positive feedback, I get giddy. One of my "strengthnesses" is that I often get bored and always seek to try different things and improve. Why is this a "strengthness?" It's a strength because I'm always learning new things and challenging myself, but it's also a weakness because I often feel a lot of pressure to make things better. I'm constantly thinking about how to make this blog a better resource, but I suddenly realized that I really need to hear from YOU. What is it you like? What would you like to see more of? Would you like to see different types of books featured? I created a brief six-question survey in hopes of capturing your feedback. I would greatly appreciate it if you'd complete it and let me know how I can make The Well-Read Child a helpful resource. I'll post the results here in mid-June. Ms. Tullo asked me to write a sonnet. So I did. The rhymes suddenly slacken in the last quatrain, which I like (I think in general poetry teachers ask for looser rhymes for a form like this so it doesn't sound so sing-songy, but I don't see that as necessary in general). The round-up is at Becky's Book Reviews. 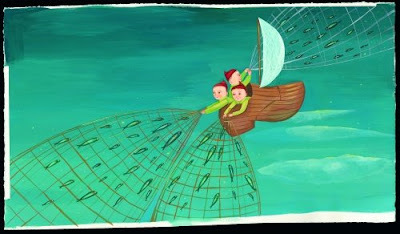 Thumbelina: Tiny Runaway Bride by Barbara Ensor is a contemporary spin on the classic tale of the tiny girl, Thumbelina. The book begins showing Thumbelina's mother, Anne Marie, who is desperate for a child handing over her life savings to a witch. Anne Marie gets her child, and as we all know, this child is so small that her mother names her Thumbelina. As Thumbelina grows, we see that her mother becomes extremely overbearing and overprotective. She reads Thumbelina's diary, edits her spelling and grammar, and writes her own comments to her daughter's private thoughts in the diary itself. Thumbelina is a bit spunky and longs to go outside on her own and to have a bit of freedom. When her mother reluctantly grants her wish, she is carried off by a mother toad, looking for a bride for her son. The rest of the story chronicles Thumbelina's escape from the toad and her adventures that follow. Scattered throughout the book are inkblot illustrations that resemble the Rorschach inkblot test. Thumbelina's messy handwritten diary entries with sentences and words crossed out are endearing and look like many of my own diary entries when I was that age. Tweens will relate to Thumbelina's desire to have a bit of freedom and will enjoy this lighthearted and fast-paced book with an unconventional ending. Kids who enjoy this book may also enjoy Barbara Ensor's Cinderella (As If You Didn't Already Know the Story). The Joosse/Lavallee team are back with their latest installment of what Barbara Joosse calls her "Great Big Family," series. I became a huge fan of this series right after my daughter was born when I saw Mama, Do You Love Me? and Papa, Do You Love Me? in our local bookstore. I scarfed up a copy of each, and they've become a staple in our story time routine since. Mama, Do You Love Me? explores the undying and unconditional love an Inuit mother has for her child, and Papa, Do You Love Me? examines the same type of unconditional love a Maasai father has for his son. While the books depict parents and children of different cultures, they hold the common theme of loving your child no matter what--a theme that I suspect most parents identify with, and most children take great comfort in hearing. Grandma Calls Me Beautiful also explores this theme, this time focusing on the love a Hawaiian grandmother, Tutu, feels for her granddaughter whom she calls Beautiful. The story begins with Tutu telling Beautiful a talk-story about Beautiful's birth. As explained in the book's glossary, a talk-story is an informal conversation, sometimes illustrated with a song, a hei (or string design), or a dance. In this case, Tutu uses a hei, a piece of string which she twists into a design to tell her story. The back of the book also contains instructions on how to make a honu (turtle) hei. 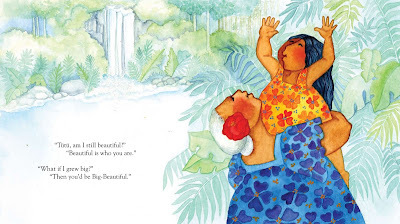 Through Tutu's story of Beautiful's birth, readers learn about Hawaiian traditions, including the custom of "sharing breath," the pressing of foreheads together and touching noses to signify love and affection. When Tutu finishes her story, Beautiful questions her beauty and elicits affirmation from her grandmother that she still is beautiful, similar to the style of questions and and answers the children ask their parents in Mama, Do You Love Me? and Papa, Do You Love Me? Beautiful: "Sometimes I scare Rooster, just to hear his big noise." Tutu: "Then you're a little bit naughty, but still, you're beautiful." Tutu later says, "You are you are--bright as a kukui torch, sweet as breadfruit pudding, soft as kapa cloth." Barbara Lavallee's vivid watercolor illustrations in tropical tones depict the tender moments between Tutu and Beautiful and exude the warmth between them. Not only does the book depict the undying love between a grandmother and her grandchild, but it teaches children about different cultures. More importantly, it also serves as a way to boost a child's self-esteem. To know that you're loved no matter what you do, or what you look like, even if you're a bit naughty at times is a wonderful and empowering feeling to have. Any grandmother would be delighted to receive this book and read it to her own granddaughter, and any granddaughter would be delighted to sit on her grandmother's lap and listen to her read the book. The entire collection would also make a beautiful gift for new and expectant parents, and I hope there will be a "grandpa" book in the future. I just now discovered the site, Recorded Books K-12, an educational blog for teachers. For the month of May, they are offering free downloads of the 1989 Newbery Medal Winner, Joyful Noise along with accompanying lesson plans. The lesson plans are designed to be used for a variety of age levels, making them ideal for classroom and home school teachers. If you already use audiobooks as part of your curriculum or if you've always wanted to try them, you may want to consider downloading the materials. It looks as if the free materials are only available through May 31, 2008, so if you ARE considering it, it wouldn't hurt to download them and use them later. I'll keep my eye out for more free literature-based resources! Kids are fascinated with babies. They love to touch them, beg to hold them, and enjoy looking at them, so I think they will really love this week's baby/preschooler pick. 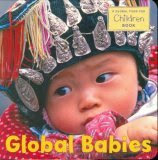 Global Babies is a board book that features 17 beautiful photographs of babies around the world. Gorgeous babies from Thailand, Mali, the United States, Afghanistan, and more are dressed in customary clothing and show their distinct personalities. For example, the baby from Fiji sits on its knees with its hands behind its head just grinning at the camera, and a baby with large, glowing eyes from Rwanda peeks out from the multi-colored wrap that holds it close to its mother. The text itself is one sentence that spans across the book, demonstrating what all babies have in common, regardless of where they're from. Young children will be captivated by the photographs of all the babies in the book, and older preschoolers may be inspired to learn more about the different countries represented in the book. I can think of a number of expansion activities to teach children more about geography, different, cultures, and more. In a simple, approachable format Global Babies helps children develop an appreciation for diversity and teaches us that despite all of our differences, we are all the same. For children learning how to form questions and answers, go through the book, pointing to the picture, asking: "Where does this baby live?" Prompt the child to respond with, "This baby lives in _____." Do you have a review of Global Babies? If so, leave a comment with your link, and I'll post it here. I'm still catching up from a weekend away, so I'm a little behind on this news. However, I wanted to share just in case you haven't seen what's going on in the kidlitosphere. First, the May Edge of the Forest is up. We have two great columns this month: Candice Ransom considers Magic Elizabeth for A Backward Glance and Sarah Mulhern tells us what her students are reading in our Backpacks column. And today marked the kickoff of the second annual Summer Blog Blast Tour hosted at Chasing Ray. Bloggers around the kidlitosphere will be featuring interviews with some well-known authors and illustrators. Check out the schedule here. Finally, check out The Reading Tub's Reading Round-Up where you can find all kinds of links to reading and literacy news. Every now and then, I come across a story of survival that is truly amazing and defeats all odds. Arn Chorn-Pond's story as told in A Song for Cambodia written by Michelle Lord and illustrated by Shino Arihara is one of them. Arn had a happy childhood full of music, love, and laughter in his small Cambodian village until Khmer Rouge soldiers invaded his village in 1975 and tore his family apart. A brief history of Khmer Rouge's invasion on Cambodia in the 1970's is included in the foreward. Led by Pol Pot, the intent was to turn Cambodia into a communist country, but the Khmer Rouge used violence and terror in their attempt and ultimately killed 1.7 million men, women, and children during their 4 year reign. Arn Chorn-Pond was one of the lucky children who survived, but it was not an easy feat. When he was separated from his family, we was sent to a children's work camp. With no shoes and little to eat, Arn was forced to work in the rice paddies. When the soldiers asked for volunteers to join a musical group, Arn volunteered and learned to play the khim, a wooden string instrument. He luckily had a talent for this instrument which ended up saving his life in the camp. Without giving too much away, Arn managed to escape the camp, and through even more adversity, ended up surviving and was adopted by a missionary who brought him to the United States. The afterword tells how Arn used his good fortune to give back to Cambodia and help rebuild and bring music back to a war-torn country. Without going into graphic details, Michelle Lord tells the true story of the horrors Arn and many other Cambodians faced. Ms. Lord masterfully tells the story in a way that is appropriate for and not condescending to children, yet she doesn't sugar coat the facts. We see Arn and his mother tearfully clinging to each other as the soldiers invade their village; we see children being led into a forest to be killed; we see Arn struggle with adapting to a new culture and experience nightmares and sadness for the loss of his family. The reader is left with no doubt that something terrible has happened. Shino Arihara's gouache illustrations are mostly done in muted earth tones, depicting the dark and sad tone of the story. We see brighter colors at the beginning of the story before the invasion and again at the end when Arn plays music in his new home. At the back of the book is a photograph of Arn Chorn-Pond, smiling and standing in front of a house he's building in Cambodia, and a comprehensive list of sources demonstrates the thorough research Michelle Lord conducted to write Arn's story. A Song for Cambodia is a touching and inspirational story full of discussion opportunities, making it an excellent addition to a child's home library or a social studies classroom. Visit the Nonfiction Monday roundup at Picture Book at the Day. If you have a review of A Song for Cambodia, leave a comment with your link, and I'll post it here. I just returned from a weekend in Morgantown, WV to see my younger sister graduate from pharmacy school. As I watched her walk up to the podium and get hooded, I felt an immense pride for her. She has truly worked very hard to get this degree, and I know she will have a successful and fulfilling future. On the four-hour drive home, I couldn't help but think about how many people will never even get the opportunity to go to college, much less graduate from pharmacy school, because they never learned how to read. My main mission for this blog is to help parents, teachers, librarians, aunts, uncles, grandparents, etc. instill the love of reading in the children in their lives. I often talk about reading for fun and give recommendations for books that children can have fun with because I strongly believe that if reading is not thought of as being fun, children simply won't ever pick up a book and read it unless they're required to. However, I'm not a strong proponent of reading because it's simply fun. Do a quick Google search, and you'll find tons of sites that discuss the benefits that stem from reading with children. Not only does it create a bonding experience between a child and the adult reader, but it helps develop language and listening skills, sparks creativity, and much much more. Most importantly, knowing how to read is essential for being able to live a productive life. I've mentioned before that I'm a former literacy tutor who worked with adults to help them build literacy skills. I've also witnessed firsthand how illiteracy can impact a teenager's self-esteem. When I taught ESL, I had students from all over the world. Some of these students were refugees from war-torn countries like Somalia, Afghanistan, and Iraq, and most of them had missed years of schooling and had either never been taught to read or write or had first or second-grade level skills. While everyone's life stories were just as diverse as their backgrounds, the thing they had in common was a deep embarrassment for not knowing how to read. Before and after tutoring sessions they would tell me how frustrating it was not to be able to read road signs, menus, nutritional information on food boxes, and not being able to fill out simple forms. They talked about feeling "dirty" and "stupid" because in order to get by, they had to lie about being illiterate to get people to help them. Also, most of my literacy students felt a deep rage about being allowed to get by in school. They'd been denied what they considered a basic survival skill. For many, it was easier for teachers to pass them than to help them, and I personally experienced this when I had to fight hard to get services for my high school students. It was easier to use their language barrier as an excuse than to enroll them in literacy programs. In addition, our nation's school system seems to be turning into one focused on teaching children how to pass tests than teaching them life skills that will help them become successful adults. Teachers are being evaluated based on how their students perform on one multiple choice test and are being forced to "teach to the test." In my school system, it was easier to focus on the kids who had potential to pass the state standards of learning tests than to help the ones who couldn't. They seemed to accept that there would be some failures instead of helping these "failures" develop basic literacy skills. Can you imagine what that does to a child's self-esteem and motivation, to realize that you are one of those "failures" and that people have given up on you? This is completely unacceptable, and it takes a community of people to be able to change this. So, I implore you to take a look at these warning signs of struggling readers, and if you notice them in a child in your life, please seek help. If you meet resistance along the way, don't give up. Our children, every single one of them, deserve a chance to live a successful life. They deserve the chance to be able to fill out a job application and read a map. They deserve a chance to feel like a contributing member of society. They deserve the chance to spend a rainy Saturday afternoon curled up with a good book. In Christina Meldrum's debut novel that was just released this week, fifteen-year-old Aslaug has been isolated from society by her eccentric and haunted mother. She doesn't even know who her father is, and her mother has never revealed his identity to anyone. In fact, she has claimed that Aslaug was an immaculate conception, a claim that plays a pivotal role in the book. Even though Aslaug's been isolated, her mother has given her an education that pales in comparison to her peers. She's fluent in Greek, well-versed in ancient runes, and knows how to use local herbs and plants for nutritional and medicinal purposes. In fact, when Aslaug's cancer-ridden mother dies of a jimsonweed overdose, Aslaug is a suspect in her murder. Jimsonweed, also known as madapple, can help ease pain, but too much can kill someone. After her mother's death, Aslaug finds an aunt and two cousins who live in a nearby town who take her in. Aslaug soon discovers that this family has its demons, and she ends up being caught in a dark and twisted plot that eventually ends up with Aslaug being on trial for murder. Christina Meldrum's technique and gripping plot make this book one of the best I've read this year. The book switches back and forth between Aslaug's trial and her story leading up to the trial. Meldrum, a former litigator, actually began writing this book when she was still a litigator, and her background in the legal system makes Aslaug's trial seem very believable. "...our house was a prison, but a palace, too: at times it spiraled deep into the earth, and deep into the sky, depending on Mother's mood. I see that now. Life was a revolving mystery, sometimes terrifying, sometimes maddening. But always provocative. Interesting. And although its meaning seemed beyond my grasp, it never seemed meaningless" (page 211). The suspense continues to build in the book until the very end when the truth behind the murders and more is revealed. I couldn't put this book down, and I recommend this for mature teens and adults because of the language and mature subject matter. However, without this, the twisted characters wouldn't have been believable and the bizarre plot wouldn't have been effectively executed. I sincerely hope this isn't Meldrum's last novel. If you've reviewed Madapple, leave a comment with your link, and I'll post it here. In this charming new picture book, a little girl imagines what her cat does when he wanders off at night, and she imagines what he'd tell her about his adventures if he could talk. So what does this cat do? He goes on a European Adventure of course! In verse, the girl chronicles her cat's adventures in England, France, Italy, Spain, Austria, Greece, and Holland. by jumping in the ring. In the book, a valiant-looking cat is standing in the middle of a bull ring, holding his arms out while a perplexed matador and bull look down on him. On the other side, the cat is dressed in a soccer uniform while ladies cheer him on in the stands. Kyrsten Brooker's rich and whimsical illustrations give the book an "old-world" feel and take readers back to another place and time. 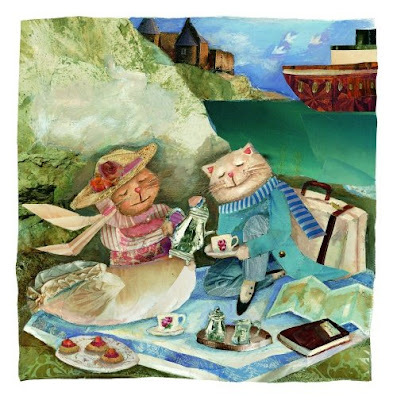 Take a look at the illustration depicting the cat's trip to England. that British cats drink tea." Caroline Lazo's words just roll off your tongue and will captivate children who are hearing the book read aloud to them. In the back of the book, readers can learn more about each country the cat visits, and the end papers depict a map of his adventure. A book that celebrates imagination and teaches kids a little about geography and other countries, this book makes an excellent choice for plain-old read aloud fun! 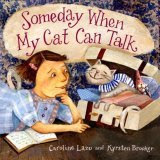 Do you have a review of Someday When My Cat Can Talk? If so, leave a comment with your link, and I'll post it here. This week's Weekly Geeks challenge is a perfect fit for this blog. Dewey is asking everyone to talk about their favorite childhood books. As I've said before, I can't even remember a time when I wasn't reading. I read and still read all kinds of books, so narrowing down to a favorite is pretty difficult. However, there a few books and series that really stand out in my memory as ones that I adored. In my baby book, my mother wrote that this was my favorite book when I was a baby. She told me that I memorized the words and "read" it to myself when I was two. I should probably get a copy of this book for my daughter and see if she likes it as much as I did. The first books that I remember having a huge influence on me were these tiny illustrated classics that were adapted for children. My Aunt Marian gave me a boxed set of 12 classic books when I was around eight years old, and I literally read them until the pages fell out. I remember being so proud to own my very own set of books. I can't seem to find a picture of them now, but they were about 6 inches long and square. My favorites included Black Beauty, Treasure Island, Sherlock Holmes and the Hound of the Baskervilles, and the Prince and the Pauper. The way they were written was very approachable and digestible for children, and it helped me develop an appreciation for classic literature. Around the same time, my fourth grade teacher, Mr. Childress, who was also an avid reader introduced me to Beverly Cleary's Ramona books. I loved Ramona's antics and identified with Beezus because I also had a pesky little sister (and brother!) I read all of the books in the set over and over again. On a similar note, I also loved Judy Blume's Fudge series, beginning with Tales of a Fourth Grade Nothing. Fudge cracked me up, and I used to read excerpts to my sister and brother. My own little brother got into lots of mischief just like Fudge, so I completely identified with poor Peter. When I was nine or ten, my Grandma Daisy gave me the Anne of Green Gables boxed set. I LOVED these books so very much and read them over and over and over again. These timeless books are still very popular with girls today. Anne is the type of heroine that girls seem to identify with even though the books were written 100 years ago. Around that same time, a close family friend gave me a box full of Trixie Belden books she read when she was a child. I fell in love with the characters and always tried to solve the mysteries in the book. I still have these books today and plan on sharing them with my daughter when she gets older. When I was little older, I found Flowers in the Attic on my Grandma Daisy's bookshelf. Once I picked it up, I was drawn into the sick and twisted lives of the Dollganger family. I call the period of time between the ages of 12 and 16 "the dark years," because I got totally hooked on all of V.C. Andrews' haunting books along with those of Stephen King and Dean Koontz. I do have to warn you that these books are meant for older readers. I was always a bit mature for my age and got a kick out of the dark and twisted plots. So, you see, I definitely read a variety of books, some that I wouldn't deem to be great works of literature. However, I always appreciated the fact that my mother always let me choose what I wanted to read and enabled me to discover books on my own. I felt a sense of freedom and great responsibility whenever I went to the library and was always excited about what I was going to read next. Wow, this time five years ago was actually a pivotal turning point in my life. I was finishing up a very difficult school year as a teacher and was struggling with the decision as to whether or not I wanted to remain a teacher or do something else with my life. I ultimately decided not to renew my teaching contract to pursue more creative opportunities. I ended up getting a job as a copywriter at a communications firm in Alexandria, VA, and today I'm still here and serve as the director of the content development team. I know I made the right decision, but I sometimes miss teaching and my students. Take care of my family, paying off all bills, etc. Aside from a five month stint overseas, I've spent my entire life on opposite corners of VA. I can't handle the pressure, so I'm taking the easy way out. Sorry MotherReader! If anyone would like to participate, consider yourself tagged! This week's baby/preschooler selection is a book that kept my daughter occupied for half an hour last night. For a 14-month old, this is no small feet. 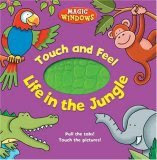 A Magic Windows Touch and Feel Book, Life In The Jungle invites children to guess the identity of a variety of jungle animals in the book. Each page presents clues to the animal's identity, along with a colored, textured panel, or window, that looks and feels similar to what the animal may feel like in real life. The illustrations on the book also show the animal's habitat, and the panel is built into that habitat. "I have bright and beautiful feathers. My beak is curved and pointy. The illustration is of a large tree with a hole in the middle. The hole is filled up with a bright blue velvety patch. After reading the clues and feeling the panel, the child can pull a tab, and out comes a "hidden" panel that's built into the book, revealing the animal. In our example, we see a colorful macaw. Other animals in the book include a crocodile, a snake, an elephant, a butterfly, and more. The text is simple enough for a young child to understand, but babies and toddlers who can't yet comprehend the language will also enjoy the textures and colors in the book. The colorful illustrations are also attention grabbing. Younger children will need help pulling out the panels because it's a little difficult for uncoordinated fingers, especially when the book is new. I'm a fan of touch and feel books for very young children because the different textures keep them engaged and help them develop a love for books. This week's nonfiction selection is part of the new "Unearthing Ancient Worlds" series. In 79 A.D. Mt. Vesuvius erupted destroying three cities in the Ancient Roman Empire: Naples, Herculaneum, and the most famous of the three, Pompeii. In 1738, a farmer was digging a well near the town of Resina and dug up marble objects from the ground. Charles of Bourbon, the son of the king of Spain, heard of these finds and sent a member of his army, Joachin de Alcubierre to Resina to find out more about these objects. Pompeii: Unearthing Ancient Worlds details Alcubierre's discovery and excavation of Herculaneum and later of Pompeii. Through full-color photographs and a detailed and engaging narrative, the book describes many of the treasures that were found as well as the things that went wrong with the excavation under Alcubierre's command. His lack of knowledge of proper excavation techniques, unfamiliarity with art, and desire to win favor with the king resulted in a rushed job, hazardous working conditions, and overlooked artifacts. After decades of backbreaking work and various setbacks, Alcubierre and his crew managed to unearth an abundance of priceless artifacts. Readers can see many of the treasures that were unearthed, including beautiful frescoes, marble statues, mosaic floors, paved streets, and public fountains. Maps, a time line, a pronunciation guide, a glossary, and a "Who's Who" section in the back of the book add to the richness of the narrative and give readers a wealth of information about these ancient cities buried under the ash. There's even a list of books and online resources where readers can go to find more information. This would make an excellent resource for lessons about Ancient Rome, archeology, Pompeii, art, volcanic eruptions, and more. Kids who are interested in any of these subjects will find the content easily digestible and the photos and illustrations interesting. If you've reviewed any books in the Unearthing Ancient Worlds Series, leave a comment with the link, and I'll post it here. Have you checked out the special children's book section in the New York Times this weekend? There are lots of reviews on a variety of children's books. Also, after 10 years (10 YEARS!!!!! ), the Harry Potter series is off the list. Dwight Garner has an interesting article about J.K. Rowling's reign. And while we're at it, check out this week's bestselling picture books. 1. Read All About It!, by Laura Bush and Jenna Bush. Illustrated by Denise Brunkus. Despite numerous negative reviews, the first-lady and recently-wed first daughter's picture book about a boy who discovers he likes to read is at the top of the list. Speaking of reviews, check out Roger Sutton's review of this book in the New York Times. Now here's a book that is worthy of its spot on the list (this its the 25th week on the list, in fact). By flipping through the book you can see a horse galloping, an eagle soaring, and many other animals in movement. The content rhymes and has funny replies that will leave your child laughing. I even saw a board book version at my local bookstore the other day. 3. 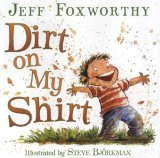 Dirt on My Shirt, by Jeff Foxworthy. Illustrated by Steve Bjorkman. Here's another book whose place on the list is probably propelled by its author's fame. It's a collection of poems that will probably get a chuckle or two out of your child. 4. Alphabet , by Matthew Van Fleet. In its fourth week on the list, this interactive alphabet book showcases a TON of plants and animals. 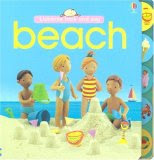 With different textures, flaps, foils, and pull-tabs, it will definitely keep your preschooler occupied for a while. 5. Knuffle Bunny Too: A Case of Mistaken Identity , written and illustrated by Mo Willems. On the list for 26 weeks, Knuffle Bunny Too is the follow up to Knuffle Bunny: A Cautionary Tale. Here, little Trixie goes to school and discovers that her beloved Knuffle Bunny is NOT the only one in the world…oh boy. Willems illustrations and story had ME laughing out loud more than once. If you’re unfamiliar with Knuffle Bunny or Willems’ other works, I highly recommend you check him out. 6 Ladybug Girl, by Jacky Davis and David Soman. Illustrated by David Soman. Meet a new kind of superhero who shows kids how to have fun in their own backyards. This would be a great choice for a younger sibling who always feel like they're "too little" to do the things their older siblings do. 7. 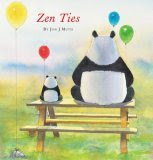 Zen Ties, written and illustrated by Jon J. Muth. In its 16th week on the list, this is a heartwarming story of a Buddist panda who encourages his nephew and friends to help a grouchy neighbor. They’re surprised by what they get in return. 8. My Dog May Be a Genius, by Jack Prelutsky. Illustrated by James Stevenson. Poetry books sure are popular this week. This book of funny poems features a pig in a bathing suit, a skunk in a courtroom, a witch in a hardware store, and more. 9 Don't Bump the Glump! : And Other Fantasies, written and illustrated by Shel Silverstein. Originally published in 1964, Shel Silverstein's first book of verse is still a hit with children and parents. 10. I Love You More, by Laura Duksta. Illustrated by Karen Keesler. If you're looking for a sweet and sappy book that illustrates a mother's love for her child, look no further. This makes a great gift for a new mom or a great mother's day gift. There's still time to go out to your bookstore and grab a copy. Happy Mother's Day everyone! I'm off for the rest of the day to do "mothery" stuff.